Here's the second in a three part series on how and why certain kids get to play key positions such as point guard, pitcher, and quarterback. 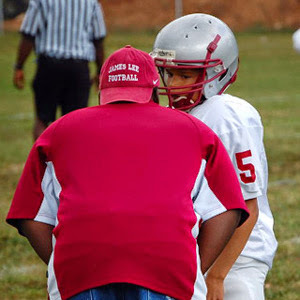 In this post, we take a look at how organized sports and coaches impact your child's opportunity to develop the necessary skills to play a key role. Having provided some general background on who gets to play the key positions and why, let's move on and discuss how youth coaches impact your child's development. At the earliest ages, kids are taught fundamental skills by adults—often by volunteer coaches who both enjoy the sport and understand how to play and teach it. Under their guidance, every child ideally has an equal opportunity to play each position. But as the examples in the previous post illustrate, youth sports are structured play involving interaction between the team’s participants. Sometimes it may be necessary for a coach to play certain children more at a given position to achieve any development of team play. Youth coaches face another obstacle with their youngest players. Because of their inexperience, these children may struggle to learn one position and associated skills, let alone multiple positions. For these children, a coach may believe it’s in their best developmental interest to focus on a single role for the current season. As a child develops and gains experience, he or she may begin to demonstrate abilities to play a key position. But an underlying characteristic of most participation-based programs is that kids of different ages, sizes, skill levels, and innate athletic ability, are grouped together. Expectations of what makes up a "fun" and successful experience vary. Although a child may have developed some skills, he or she may still be underperforming relative to other children and the level of competition. And playing a child who is overmatched at a key position invites failure for both the child and the team. With limited practice time and the importance of certain roles to a team's opportunity to succeed, it's simply unrealistic for a coach in the typical youth program to provide every child with equal time at the key positions. As the above paragraphs highlight, there are barriers in organized youth sports that may work against your child’s opportunity to play an important role and position. But organized sports can provide your child with the instruction needed to play that “glory” position. Your child may quickly assimilate this knowledge and become his or her team’s point guard, quarterback or pitcher. So let’s now discuss the coach’s role in developing your child’s ability. Your child will benefit most from a coach who uses the Teach Everyone Everything (TEE™) approach in practices. This coach teaches all of the fundamental skills to every kid on his or her team. This instruction incorporates both the demonstration of a skill and the equal opportunity in practice for each child to practice the associated technique (usually via a drill). Through this means, every child is provided the skill instruction that is required to play any position in the game. This does not mean that each child receives equal time at every position in practice scrimmages or games. Your child may still only play a relatively minor role on his or her team. But through the TEE approach, every child does receive the instruction that can unlock their potential to play any position. Your child’s coaches should always look for opportunities to challenge your child. There are sometimes opportunities in practices and games where a coach can give kids a taste of playing a key role. And for the occasional child who develops quickly, a coach should expand the child’s team role during the course of the season. One of the most important characteristic to look for in your child’s coach is his or her ability to create a fun environment that inspires your child to want to play the game, learn more, and practice. In the end, it’s your child’s natural abilities, desire, and acquired skills that determine what position your child plays. But a coach who opens your child’s eye to his or her potential is an important factor—especially for those children who may not be as athletically gifted. If you feel that a coach is not giving your child an opportunity to fully develop his or her talent, you may be asking yourself, "Do I have any other options?" In next week's article, we'll finish this series by looking at how pickup games and the choices you make can improve your child's opportunity to learn a sport in a way the maximizes his or her chance to play a key role.